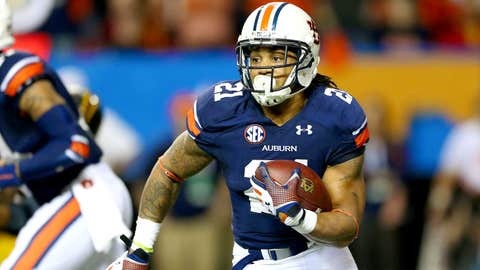 Tre Mason and Auburn have found a way to pull out close wins all year. All season long Florida State has dominated opponents, winning every game by 14 or more points. Meanwhile just about every game Auburn’s played has left its fans nervous. Whether it was Week 1 against Washington State or against Mississippi State, Ole Miss and Texas A&M or the miracles against Georgia and Alabama, the Tigers had many close calls. All could have easily been Auburn losses. If things had gone bad for Auburn down the stretch, we’re talking about a team that could be 5-7 on the season. Forget about playing for the BCS title — Auburn really wasn’t that far away from not playing in a bowl game at all. If you’re trying to figure out why Las Vegas has gone 2-11 against the spread on Auburn games this season, this is the reason why: Vegas sees how close Auburn has been to losing a ton of ball games and doesn’t believe the Tigers are very good. That’s logical to a point, but it also misses a substantial detail: Auburn’s gotten better each week and those near-losses have instilled a strong inner will; the Tigers believe they will win every game. With each of those close wins has come the confidence that arises from winning tight ball games. All season long Auburn’s been playing games in a proverbial phone booth, with no real separation between it and an opponent. There’s rarely been time to exult and celebrate victory. Certainly, Auburn’s players never broke out the dry erase board on the sideline to play hangman. Unlike Florida State, which has just one top 25 BCS win all season (according to the final ranking) — against No. 12 Clemson — Auburn has four top 25 wins in Alabama, Missouri, Texas A&M and Georgia. Florida State has a great deal of swagger and confidence, but what it doesn’t have is much experience making plays against good teams in pressure-packed situations. That’s because FSU has dominated everyone all season long, making the fourth quarters of its games leisurely gaming pursuits more than white-knuckled thrill rides. If you want to make a sporting analogy, FSU’s 2013 team is a lot like Mike Tyson back in the 1980’s — nasty and invincible, totally unchallenged by the competition. Maybe FSU will show up in the BCS title game and destroy Auburn, ending all doubt about who is the better team by the third quarter. For me the question isn’t so much whether or not Auburn can win — it’s whether or not Auburn can keep the game close. Because I think if Auburn keeps it close, the Tigers will find a way to win the game. We know that Auburn can win close football games — the SEC-tested Tigers expect to make plays in tight games to win. Do we know that about Florida State? Jameis Winston has been stellar all season. But when has he been forced to make a play with the game on the line? When has he had the ball in his hands and had to have a touchdown? When has a win or a loss come down to a single play? Never in his college football career. Winston’s unflappable and talented, but he doesn’t have any experience in close games. He’s still just a redshirt freshman. Sooner or later he’s going to have a bad game. Sooner or later another team will match his Seminoles score for score. That’s why the story of this game is simple — either Florida State wins big or Auburn finds a way to win. Ultimately, I think the Tigers do what they’ve done all season — find a way to win. A Tiger win would also pull off the inconceivable — all five BCS games would be won by the underdog. Come late Monday night, it will be reality. And the Auburn Tigers will be hoisting the crystal ball heavenward for an eighth straight SEC national title.